Bartitsu is possibly the first instance of what we know today as mixed martial arts. The Bartitsu Society compiled it’s members research from various historical publications and published the results which fund historical education on the subject. 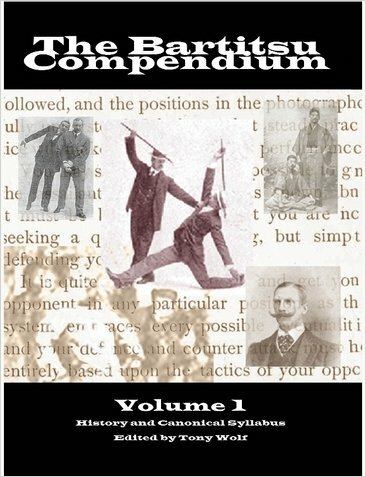 Bartitsu Compendium 1 and Bartitsu Compendium 2 are available under the links. William Barton-Wright combined elements of boxing, jujitsu, cane fighting, and french kick boxing in order to create a self defense system that could be used by discerning gentlemen on the streets of London during the Industrial Revolution. It is an eclectic martial art and self-defence method originally developed in England during the years 1898–1903, combining elements of boxing, jujitsu, cane fighting, and French kickboxing. William Barton-Wright was an English railroad engineer. A physical fitness and self defense enthusiast Barton-Wright had reportedly previously studied boxing, fencing, wrestling, savate and the use of the stilletto under recognized masters of the various arts. His work as an engineer took him to Japan for three years where he discovered to jujitsu and studied at the school of Jigoro Kano. On returning to England which was heavy with crime due to its rapid growth, Barton-Wright opened a health club and self defense school for the upper class. In 1899, Barton wrote an article in the London's Pearson’s Magazine, entitled “A New Art of Self Defense.” In it he set out his system of self defense which he called “bartitsu,” an obvious melding of his name and jujitsu. The Bartitsu Club brought in some of the best martial arts teachers from around the world, among them were the first Japanese instructors from the Kodokan Society to teach JuiJitsu in Europe; Kaneo Tani, Seizo Yamamoto, and Yukio Tani. Kaneo Tani and Yamamoto soon returned to Japan, but Yukio Tani stayed and was shortly joined by Sadakazu Uyenishi. Additionally instructors included Pierre Vigny and expert in Swiss Cane fighting and instructor in savate, and professional wrestler Armand Cherpillod. The Bartitsu Club was among the first schools of its type in Europe to offer classes in women's self-defence. The club was also home to a cabal of fencer/historians led by Egerton Castle and Captain Alfred Hutton, who were devoted to re-constructing the ancient arts of fencing with the rapier and dagger and two-handed sword, and who also taught stage fencing classes to some of London’s acting elite. The last recorded activities of the Bartitsu Club as an entity involved a series of touring exhibitions and contests at venues during the period January–March 1902. By 1903, the Bartitsu Club closed and most of its instructors established their own self defense schools in London. William Garrud, a physical culture instructor at the Bartitsu Club, and his wife Edith Garrud would become students of Uyenishi at his JuiJitsu school. When Uyenishi left England to return to Japan in 1908, William took over as the owner and manager of the Golden Square school and Edith became the instructor of the women's and children's classes. The Garruds popularised jujutsu by performing numerous exhibitions throughout London and by writing numerous articles. In 1905, ju-jutsu pioneer Sadakazu Uyenishi and his students issued the "Textbook of Ju-jutsu". It was partly illustrated with "cinematographics" produced by the Gaumont Film Company. In recent years the Bartitsu Society has taken the frames from archives and reanimated the footage. Founded in 1903 the Women's Social and Political Union (WSPU) was controlled by Emmelline Pankhurst and her two daughters Christabel and Sylvia. It specialized in highly visible publicity campaigns such as large parades. This had the effect of energizing all dimensions of the suffrage movement. While there was a majority of support for suffrage in parliament, the ruling Liberal Party refused to allow a vote on the issue; the result of which was an escalation in the suffragette campaign. The tactics of the WSPU included shouting down speakers, hunger strikes, stone-throwing, window-smashing, and arson of unoccupied churches and country houses. Law enforcement became involved in shutting down these demonstrations and hunting down vandals. By 1909, jiujitsu instructor Edith Garrud was becoming increasingly involved with the radical women's rights movement. She was teaching her “Suffragettes Self-Defence” classes at Leighton Lodge in Edwardes Square, Kensington and performing politically charged demonstrations in which she defeated men dressed in police uniforms. In 1913 – in response to the Cat and Mouse Act, which allowed hunger-striking suffragette prisoners to be released and then re-arrested once they had recovered their health – the WSPU responded by establishing a thirty-member, all-woman protection unit referred to as "the Bodyguard", the "Jiujitsuffragettes" and the "Amazons", to protect fugitive suffragettes from re-arrest. Edith Garrud became the very first trainer of the Bodyguard and taught them jujutsu and the use of indian clubs as defensive weapons in preparation for their violent confrontations with the police. The "Amazons" would be the personal bodygaurd to the movements leader Emmelline Pankhurst. The Bodyguard fought a number of well-publicised hand to hand encounters with police officers who were attempting to arrest their leaders. On several occasions they were also able to stage successful escapes and rescues, making use of tactics of disquise, misdirection and decoys to confuse law enforecement. A number of these incidents are described in the unpublished memoir of Bodyguard member Katherine "Kitty" Marshall, titled "Suffragette Escapes and Adventures". The Bodyguard was disbanded shortly after the onset of the First World War. Emmelline Pankhurst suspended militant operations of the WSPU to support the British Government during the First World War.